For those of you expecting another post on new equipment or anything else boating related, you can log off now. It has been an interesting year to say the least. We have made many changes, some planned and some totally unexpected. But in the end we believe they will all be good changes and we don't regret any of them, well almost. Let me just say that our philosophy has changed considerably over the years and we have taken a more optimistic approach to the things that happen in our lives. Not too long ago, a loss of a job or changes in our circumstances would have had us energizing ourselves to correct the situation and make it conform to our plans. But something happened and I can't put my finger on just when the transition took place, or what the defining moment was. We came to the realization that if we looked closely at unfolding events, instead of trying to steer them in the direction we chose, we would see a different path open up that in the end was the proper direction for us. We were enjoying life in South Carolina and had settled in and things were not great but pretty good. Suddenly we found ourselves in the middle of a major recession with neither of us having a job and no prospects for the immediate future. Most folks might panic in a situation like this. But we have positioned ourselves financially to be in pretty good shape and our cruising lifestyle has kept us in a debt free state, or close to it, and the constant practice of filling the cruising kitty keeps us fairly fluid. When the job Susan had in Beaufort came to an end, and no viable employment looked available, then we considered our options. We could stay and tough it out, not our first choice. We could head south for warmer weather, but the economic situation in that area was not looking great either. Or we could head north where we had a good support system and lots of contacts with a greater potential for employment. The logical conclusion, and all of the sign posts, pointed us to the road north. This was not our favorite choice mostly because after more than 15 years in the tropics and subtropics, northern winters were not particularly inviting. Those are words I never thought I would hear myself say again, but never say never. 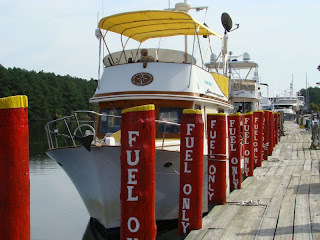 We realized when we decided to come back to the Chesapeake for a while that we would once again have to deal with owning a boat in the cold north. We also realized that if we came north it would be the coldest, snowiest winter on record. The decision was made the last time we were here, to not live aboard the boat in the winter months. It was just too much of a hassle and too uncomfortable for us after more than 15 years living in the subtropics. We were fortunate enough to find a good house sitting position for some nice folks that spend the winters in warmer climates like we should be doing. 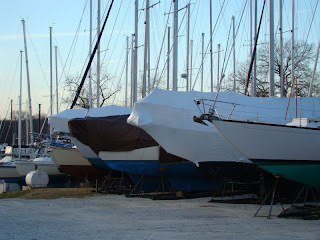 Their schedule worked nicely with ours for hauling the boat and then relaunching in the spring. So with that in mind, when December first arrived, we began the move off process and winterized the boat, most of it done prior to the haul out.